Two CDs containing 65 well-known tunes from Scotland, Cape Breton, Ireland, Quebec, and New England: Reels, jigs, strathspeys, marches and airs, plus an A for tuning. I play every tune fast and then slow (except the airs, since they're already slow!). I recorded it in my living room but the sound quality is pretty good, and it's right at pitch. For a list of the tunes, see the extended liner notes. Two CDs: 82 tunes. The repertoire is mostly Scottish, plus a few Cape Breton and Quebecois tunes. There are reels, jigs, strathspeys, marches, airs, and waltzes, plus an A for tuning. As on Tunes 2001, I play every tune fast and then slow. Each two-CD set costs $25 US or $37 CAN, plus shipping. Once you've ordered Tunes 2001, feel free to print out and use the extended liner notes. 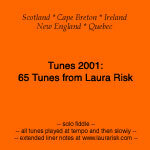 Extended liner notes for Tunes 2003 are coming soon! To order Tunes 2001 or Tunes 2003, click here.